Oakland fell 34-3 to the San Francisco 49ers in what was another poor showing by the Raiders at Levi's Stadium on Thursday. But, for the 49ers and fill-in starting quarterback Nick Mullens, their second victory could not have come at a better time as they gear up for their last seven games. Jon Gruden's Raiders are now 1-7, while the 49ers improved to 2-7 this NFL season. 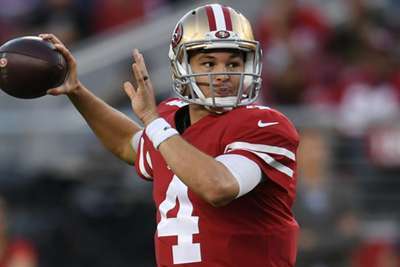 No-one is asking that anymore after the 49ers quarterback led the team to their second victory of the season. The former practice squad signal caller got the starting nod in place of an injured C.J. Beathard (wrist), who took the place of starter Jimmy Garoppolo (knee). He showed what he could do on the opening possession of San Francisco's 31-point victory. Mullens' first regular-season NFL drive ended with an 11-yard touchdown pass to cap off a six-play, 75-yard drive. He went a perfect three-for-three during that scoring drive. He followed that drive with another touchdown, this time a four-yarder, and put together three more scoring drives to boot. He is one of only two quarterbacks since 2000 to throw a touchdown pass on each of his team's first two possessions on his NFL debut. He joins Marcus Mariota, who accomplished that feat in 2015. Mullens finished 16-of-22 passing for 262 yards and three touchdowns. Gruden did not envision his return to Oakland including a 1-7 record with some of the worst performances in the NFL. Nothing seems to be going the Raiders' way this season. "I know it's not looking pretty right now," Gruden admitted after the game. What is worse is that quarterback Derek Carr has not been been that bad. Carr has completed 72 per cent of his passes through eight weeks, including a 72.7 per cent completion rate for 171 yards against San Francisco. But, along with his 10 touchdowns, he has thrown eight interceptions and been sacked 24 times. He has had little help against the pass rush and is playing with an offensive line that gave up eight sacks on Thursday. Carr was brought down seven times and Raiders backup AJ McCarron, who finished the game, was sacked once. It is going to be a tough road ahead for Gruden, Carr and the rest of the silver and black. Yes, the 49ers beat the Raiders. But, both teams entered Thursday's game struggling – and struggling mightily. The victory was impressive considering the only playing time Mullens had a year ago was on the practice squad. But, against Oakland – who have the worst run defense in the league in yards allowed per game (144.7) and the 10th worst passing defense in yards allowed per game (263) – the feat is not a season changer. The real test for San Francisco will be if they can build on their success against the Raiders. The 49ers will face the Giants, also a struggling team who are just 1-7, before taking on the Buccaneers, Seahawks and Broncos. They will have a chance to pick up some momentum against New York before travelling to Tampa Bay.